Randomised controlled trials are widely accepted as the most reliable method of determining effectiveness, but most trials have evaluated the effects of a single intervention such as a drug. Recognition is increasing that other, non-pharmacological interventions should also be rigorously evaluated.1-3 This paper examines the design and execution of research required to address the additional problems resulting from evaluation of complex interventions—that is, those “made up of various interconnecting parts.”4 The issues dealt with are discussed in a longer Medical Research Council paper (www.mrc.ac.uk/complex_packages.html). We focus on randomised trials but believe that this approach could be adapted to other designs when they are more appropriate. There are specific difficulties in defining, developing, documenting, and reproducing complex interventions that are subject to more variation than a drug. A typical example would be the design of a trial to evaluate the benefits of specialist stroke units. Such a trial would have to consider the expertise of various health professionals as well as investigations, drugs, treatment guidelines, and arrangements for discharge and follow up. Stroke units may also vary in terms of organisation, management, and skill mix. The active components of the stroke unit may be difficult to specify, making it difficult to replicate the intervention. The box gives other examples of complex interventions. Problems often arise in the evaluation of complex interventions because researchers have not fully defined and developed the intervention. 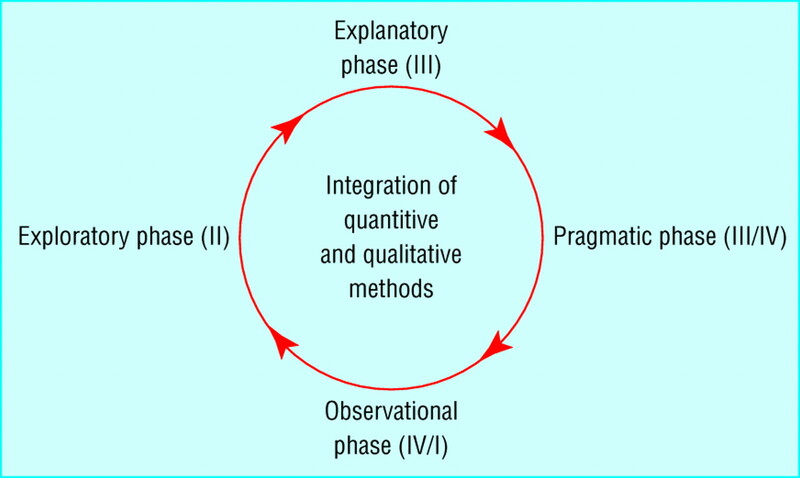 It is useful to consider the process of development and evaluation of such interventions as having several distinct phases. These can be compared with the sequential phases of drug development (fig 1) or may be seen as more iterative (fig 2). Either way a phased approach separates the different questions being asked. Progression from one phase to another may not be linear. In many cases an iterative process occurs—for example, if an exploratory trial finds that a complex intervention is unacceptable to potential recipients, the theoretical basis and components of the intervention may have to be re-examined. Preliminary work is often essential to establish the probable active components of the intervention so that they can be delivered effectively during the trial. Identifying which stage of development has been reached in specifying the intervention and outcome measures will give researchers and funding bodies reasonable confidence that an appropriately designed and relevant study is being proposed. Qualitative research can also be used to show how the intervention works and to find potential barriers to change in trials that seek to alter patient or professional behaviour.7 For example, if health professionals see the main barrier to changing their practice as being lack of time or resources, an intervention that focuses only on improving their knowledge will not work. In phase II the information gathered in phase I is used to develop the optimum intervention and study design. This often involves testing the feasibility of delivering the intervention and acceptability to providers and patients. Different versions of the intervention may need to be tested or the intervention may have to be adapted to achieve optimal effectiveness—for example, if the proposed intensity and duration of the intervention are found to be unacceptable to participants. It is also important to test for evidence of a learning curve, leading to improved performance of the intervention over time. If a learning curve exists a run-in period might be needed before formal recruitment to the trial to ensure that the intervention is provided effectively. The exploratory trial is also an opportunity to determine the consistency with which the intervention is delivered. Consultations could be audio or video taped to give feedback of performance to providers together with training to promote consistency. The content of the comparative arm (control group) of the main trial will be decided during the preparatory phase. It may be an alternative package of care, standard care, or placebo. Although standard practice is often an appropriate control, it can be as complex as the intervention being evaluated and may change with time. It is thus important to monitor the care that is being delivered to the control group. The use of a no treatment control group may be unacceptable to patients. One possible solution is a randomised waiting list study in which all participants ultimately receive the intervention. 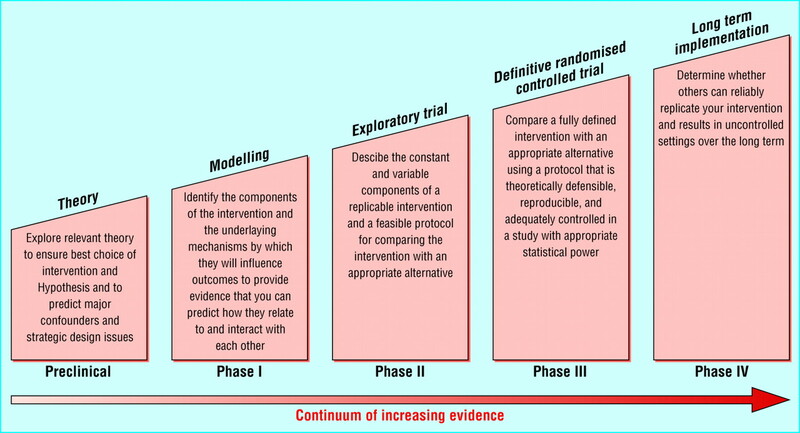 The exploratory phase should ideally be randomised to allow assessment of the size of the effect. This initial assessment will provide a sound basis for calculating sample sizes for the main trial. Other design variables can also be established in an exploratory trial. An important decision in trials of complex interventions is whether health outcome needs to be assessed. For studies such as those evaluating strategies to change professional behaviour, it may be sufficient to show that the intervention changed behaviour, provided that clear evidence exists that the changed behaviour—for example, prescribing particular treatments—is effective. It is often not possible to conceal allocation of treatment from the patient, practitioner, and researcher in complex intervention trials. The potential biases of unblinded trials therefore have to be taken into account. Dissimilar levels of patient commitment between intervention and control groups may cause differential dropout, making interpretation of results difficult. When patients have strong preferences, a preference trial design may be used; patients without strong preferences are randomised as usual but those with strong preferences receive their preferred treatment.13 The results of such trials can, however, be difficult to interpret. The findings of trials of complex interventions are more generalisable if they are performed in the setting in which they are most likely to be implemented. Eligibility criteria must not lead to the exclusion of patients—for example, on the grounds of age—who constitute a substantial portion of those to whom the intervention is likely to be offered when implemented in the health system. Poor recruitment to a trial can also raise doubts about generalisability. The purpose of the final phase is to examine the implementation of the intervention into practice, paying particular attention to the rate of uptake, the stability of the intervention, any broadening of subject groups, and the possible existence of adverse effects. As in the case of drug trials, this might be carried out by long term surveillance, although currently there is no established mechanism for funding such activities. Trials of complex interventions are of increasing importance because of the drive to provide the most cost effective health care. Although these trials pose substantial challenges to investigators, the use of an iterative phased approach that harnesses qualitative and quantitative methods should lead to improved study design, execution, and generalisability of results. We thank the participants at a MRC workshop on complex interventions for their contribution. This article represents the views of the authors and does not represent the official view of the Medical Research Council.
. Psychological treatments and their evaluation. Int Rev Psychiatry 1998;10:123–126.
. Why do we need randomised controlled trials to assess behavioural interventions? BMJ 1998;316:611–613.
. Surgical procedures and devices should be evaluated in the same way as medical therapy. Controlled Clinical Trials 1997;18:478–487. Collins English dictionary. London: Collins, 1979.
. Innovations in services and the appliance of science. BMJ 1995;310:815–816.
. The effectiveness of hospital at home compared with in-patient hospital care: a systematic review. J Pub Health Med 1998;20:344–350.
. Barriers and bridges to evidence-based practice. BMJ 1998;317:273–276.
. Evaluating patient based outcome measures for use in clinical trials. Health Technology Assessment 1998;2(14): 1–74.
. Health services research clinical trials: issues in the evaluation of economic cost and benefits. Controlled Clinical Trials 1999;19:149–158.
. Ethical issues in the design and conduct of cluster RCTs. BMJ 1999;318:1407–1409.
. Methods for evaluating area-wide and organisation-based interventions in health and health care: a systematic review. Health Technology Assessment 1999;3(5): 1–110.
. Developing and implementing clinical practice guidelines. Qual Health Care 1995;4:55–64.
. Patient preferences and randomised controlled trials. BMJ 1989;289:313–315.
. Development and evaluation of complex interventions in health services research: case study of the Southampton heart integrated care project (SHIP). BMJ 1999;318:711–715.